The first visitors to Western North Carolina consisted of American Indians and early white settlers who used the area as a rendezvous and resting grounds. By the 1800s stockraisers in surrounding states, who were using Asheville as a passage and waystop for herds, forced the construction of the Buncombe Turnpike in 1827--opening the area to the outside world and sparking the construction of inns and taverns. By the mid 1880s, wealthy visitors from South Carolina and Georgia had discovered Asheville's cool mountain air, a pleasant contrast to the unbearable summer heat of the lowlands. Health seekers also took note of Asheville's mild climate. The clean mountain air was believed to have healing benefit for sufferers of consumption and other respiratory diseases. The turnpike was pumping new wealth and activity into the area. Asheville's first hotel was the Alexander Hotel, owned and operated by James Mitchell Alexander, which sat upon the east side of the French Broad River attracting visitors from Cincinnati to Charleston. As more and more attention from Eastern North Carolina and the southern states was focused on Asheville for health and holiday, the area witnessed an early development of lodging and accommodations. James Patton, the developer and namesake of Asheville's first east-west road through what is today downtown Asheville, established the Eagle Hotel in the early 1820s a short distance from Pack Square. 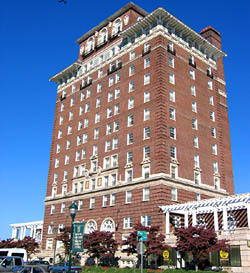 The Eagle Hotel was described as Asheville's first �luxury� hotel. At the same time, James M. Smith constructed the Buck Hotel of equal distinction, at the intersection of Broadway and College Street. Through the period surrounding the Civil War Asheville witnessed slow but steady growth in its tourist industry, mainly appealing to an increasingly wealthy clientele. When the first train arrived in October 1880, bringing modern means of transporting people and freight, the city began to claim upwards of 50,000 visitors annually. With increased visitors came an increased demand for places to stay. Hostels, boarding houses, hotels and luxury inns were erected at increasing speed. At the forefront of this building boom was the construction of the Grand Central Hotel, followed by the 1880 opening of the four-story brick Swannanoa Hotel boasting Asheville's first bathroom. Colonel Frank Coxe opened the first Battery Park Hotel in 1886. It covered a remarkable 25 acres atop what was known as Battery Park Hill. Col. Coxe foresaw the increase of winter and summer visitors and catered to the finest of tastes with daily music provided by an orchestra, ballroom dancing, fine cuisine, modern bathrooms and elevators. In 1887, the original Battery Park Hotel was host to George W. Vanderbilt who fell in love with Asheville's enchanting beauty and the majestic mountains surrounding the area. It was then he decided to purchase the land to the south �as far as the eye could see,� resulting in an estate totaling 125,000 acres of land. 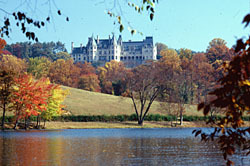 It was here he built his 250-room country estate known today as the Biltmore Estate, America 's largest private home. His presence and love of the area broadcasted Asheville's reputation as a resort city worldwide. 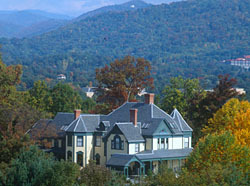 The construction of his massive, state-of-the-art home brought world-famous artisans, craftsmen and architects to Asheville. With the influx of many skilled craftsmen and architects came the building of exquisite buildings and summer residences. Detailed inns with international influence were reflected in the original Kenilworth Inn, resting atop South Main Street (present day Biltmore Avenue ) and the Manor Cottages on Charlotte Street which was completed in 1900 as an English motif hostelry. The City of Asheville began the modern means of advertising the area's appeal to visitors emphasizing not only the ideal summer and winter climate but also the plethora of activities for tourists and health seekers. These included luxury hotels, golf, horse trails, tour excursions, evening dancing, boating, picnicking, theater and outdoor movies just to name a few. The period of 1910 to 1930 produced unprecedented growth for Asheville. The city's reputation as a tourist and health retreat attracted men of great vision and substantial wealth. 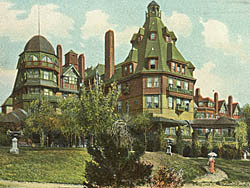 By 1912 the city boasted 14 hotels including the Vanderbilt Hotel, present-day Vanderbilt Apartments on Haywood Street, the Langren Hotel and the Oakland Heights. In 1913, Edwin W. Grove opened the famous Grove Park Inn, which he and his workers constructed in less than one year, taking stone from the nearby Sunset Mountain for the entire building. Shortly after, Grove purchased the Battery Park Hotel, leveled it and the massive hill it stood on, and constructed a new Battery Park Hotel as well as the grand public market, the Grove Arcade. Although the city witnessed a decline in development through the middle of the 20th century, beginning with the financial depression of the 1930s, Asheville remained a tourist destination. Under Franklin D. Roosevelt's administration, the Civilian Conservation Corps contributed significantly to the construction of the Great Smoky Mountains National Park and the Blue Ridge Parkway, creating much needed jobs in the area and designing a scenic byway leading tourists from as far as Northern Virginia straight into Asheville. The Biltmore Estate opened to the public in 1930 also encouraging visitors to Asheville to imagine for a day what it was like to live like a Vanderbilt. The Grove Park Inn was purchased and continued as a world class inn welcoming the likes of Henry Ford, Albert Einstein, F. Scott Fitzgerald and eight U.S. Presidents. By the 1980s and 1990s, numerous residential homes, including historic landmarks like the Richmond Hill House and the O. B. Wright House, were converted into inns and bed & breakfasts to accommodate a growing renaissance in tourism throughout Western North Carolina. Today, Asheville blends beautifully the desires of urban culture and rural arts, modern tastes and historic style, downtown entertainment and outdoor recreation, maintaining Asheville as a landmark for both health and holiday. Resorts and retreats are a mainstay for Asheville and the mountains of North Carolina. Truly the city's reputation as a place of unprecedented beauty and clean mountain resources were primary contributors to the rise of its popularity worldwide.